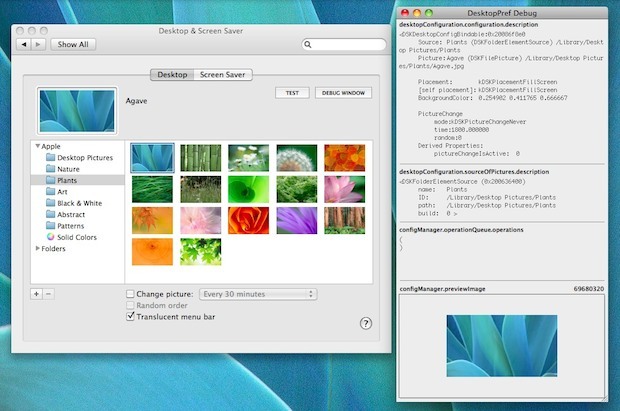 You can access two unusual debugging options in the Mac OS X System Preferences for Desktops and Screen Savers panel by using a keystroke while accessing the panel. 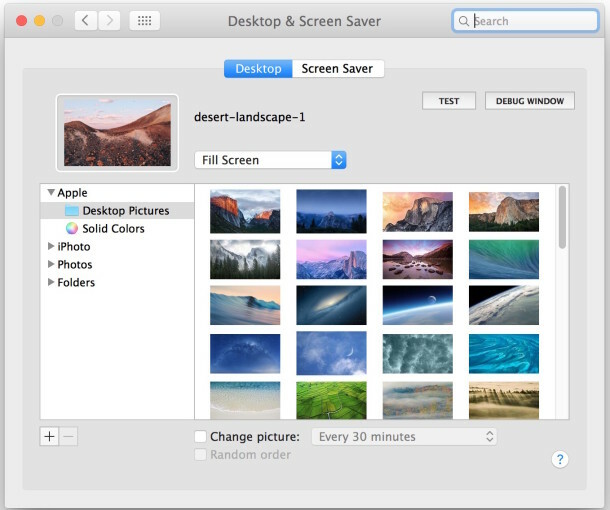 To gain access to “TEST” and “DEBUG” in the Desktop preferences of OS X, start by by holding down the Command+Option keys while clicking on the “Desktops & Screen Savers” preference pane. The first button “TEST” doesn’t seem to do anything, but the “DEBUG WINDOW” opens an inspector window that gives you information about the desktop background you choose and settings pertaining to it. We actually got this tip in reference to Mac OS X 10.7 Lion, but I tried it out in OS X 10.11, 10.10, 10.9, 10.8, and 10.6.7 and it works the same. Is there any use of these options? Probably not for most of us, but it’s kind of fun to see leftovers from development still hanging around in the OS. If anything, I can use it to make my non Mac-savvy friends think I’m performing some critical operation, when in reality, I just don’t want to let them use my laptop. […] Dock as well. If you’re not fond of the command line, you can find the path information in a hidden debug mode for Desktop System Preferences too. But good advice otherwise, especially for a Windows person.